When the first Nut Job movie graced cinema screens back in the summer of 2014, I wisely skipped it. Back then, I wasn’t really pushing myself that hard to see as many bad movies, let alone bad movies intended for small children, and to this day I have regrets over that year because it felt rather lacklustre by the time I had to put together my end-of-year list (for that year’s “Worst Of” list, I named Annie the #1 worst, and keep in mind that year also gave us Mrs Brown’s Boys D’Movie and Blended, both of which I also skipped). Since then, I have been encouraging myself to see more and more terrible films every year, even if they’re complete cinematic abominations like Grimsby or Unfinished Business, and for any sequels to films I avoided back then I have attempted to atone for my past mistakes by finally watching them via streaming services to prepare for the next instalment. One of those more recently was, of course, The Nut Job which just turned out to be a big pile of nothing with lame jokes, some horrendously cheap-looking animation, and a hilariously awful soundtrack that included, of all things, Psy’s Gangnam Style – and I feel it’s important to note at this point that the movie takes place in the 1950s, a time when let’s just say Korea wasn’t a popular choice in society (and yes, I know it was co-produced by South Korean studios, but even still, they should know better). 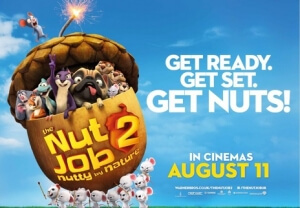 So, having gone back and finally watched the damn thing, I at least knew more of what to expect with The Nut Job 2: Nutty By Nature, and while it’s a slight improvement on the first there’s still a lot of dead zones for this sequel that don’t really make it very good. In this one, Surly the Squirrel (Will Arnett) is on the hunt once again for food when his beloved nut shop – which he and his animal friends spent the majority of the last film trying to get into – unexpectedly blows up. He begrudgingly decides to go back to the park with the others, only to find himself leading a revolt against the town’s evil mayor (Bobby Moynihan) who plans to turn the land into an amusement park. From there, all the Looney Tunes-style slapstick and DOA puns you experienced in the first one and now here all take centre stage in a minor assault to the senses. Watching both this and the first film, you can see glimpses of what the filmmakers are trying to do, which is something along the lines of an old-style cartoon made using modern technology, again not unlike the Looney Tunes cartoons or Tom and Jerry, and that shows in the way they animate some of the pratfalls and moments of violence, and even in some of the delivery by its vocal performers. However, the writing is severely undercooked and nowhere near as witty or even as funny as some of those older cartoon shorts; like the first one, it’s got plenty of terrible puns and jokes that more often than not miss the mark, with some of them being so awful they don’t even make that much sense – an animal character eats an old and dusty nut and declares it to be “delicious”, only for Surly to remark that it’s actually “dust-licious”, in an example of the writers not even trying and somehow trying too hard. None of the characters, outside of maybe Arnett as Surly but only then that’s because Arnett’s snide vocal delivery is perfect for a grouchy and sardonic character like Surly, are funny or engaging, and a lot of the time they can be annoyingly useless and clearly there just to pad the movie out to a 91-minute running time. Unless you’ve got really little kids who will probably appreciate the cute critters, there’s no reason for an adult to watch this and expect a laugh-riot, because while it may strive to be like some of the classic cartoons, the writing is nowhere near as strong as any of them. As a sequel, however, there are some minor improvements, for example the animation is a lot better in this one. Previously, there was something about how everything moved and talked that did not sit right at all, like it hadn’t been rendered properly before theatrical release and it was so dangerously close to uncanny valley territory that it could easily be mistaken for a direct-to-video production, and not even a good-looking one at that (which, for a movie that cost over $42.8 million to make, is frankly baffling). Here, however, the animation is much slicker and at the very least looks like a theatrical film; I’d say it’s due to a much larger budget, but according to sources this apparently cost LESS than the previous film to make, so I have no idea what went wrong last time. But regardless, it’s a much better film to look at which, given that a lot of it is made up of lame jokes and puns, is a blessing that at least we can visually entertained as it’s failing in the scripting department. While I can’t say that The Nut Job 2: Nutty By Nature is at all a good movie, it’s a completely inoffensive distraction for your really little ones and should be absolutely fine if you want to get them onto the much better Looney Tunes and Tom and Jerry cartoons but don’t have the resources to actually just show them first. Plus, in all its mediocrity, it’s a far better option for your children than The Emoji Movie, so by all means choose this over that, for the love of God. The Nut Job 2: Nutty By Nature is a minor improvement over the first, but still shares its overwhelming mediocrity from lame jokes to mostly uninspired (but well rendered, at least in comparison to last time) slapstick, which keeps it as far away from the quality of the old Looney Tunes cartoons it desperately wants to homage.